It’s only when you organise a party that you realise quite how many important people are missing. Katie is in Ghana, Clara is in Abu Dhabi, Immy is in India, Emma is in Singapore, Hugo is in Hong Kong, Lotty is in Columbia, Rhum is in Guatemala….and so the list goes on…it’s hard not to take it personally. But looking at the evidence, it ain’t good. Maybe it was something I said? The most entertaining excuses are always guaranteed to come from my university housemate, Ben Judah though. “Sorry, I can’t make it, I’m in Tuva” he messaged. A remote Siberian region which is a fairly unusual place to have wound up, mid-November.”I’ll be there in spirit.” he assured me. This behaviour is not entirely out of character. Since leaving university, Ben learned Russian and then embarked upon a series of extraordinary adventures: hunting for yetis, searching for gulags, chilling with shamans. He then wrote a book – Fragile Empire: How Russia Fell in and out of Love with Vladimir Putin, which The Times described (much to his delight) as being “young and cocky”. Lots of other publications said heaps more complimentary things though. “Have you met any throat singers?” I asked. “No, but the guys I’m staying with killed a lynx in cold blood” he offered – sending me a photograph of two men holding aloft a dead lynx, as proof. It looked flipping cold in the hut. Not much in terms of furniture, or carpets, or insulation of any kind whatsoever. But just as I was starting to feel sorry for Ben, the eleven ‘o clock news turned into the weather forecast: “It’s going to be colder than Siberia next week” one of the newsreaders said. “Down to zero tonight, and then in the minuses later in the week”. And so sympathy for Ben turned to self-pity. I decided the best thing to do was to make a big batch of soup to sustain myself over the chilly week ahead. 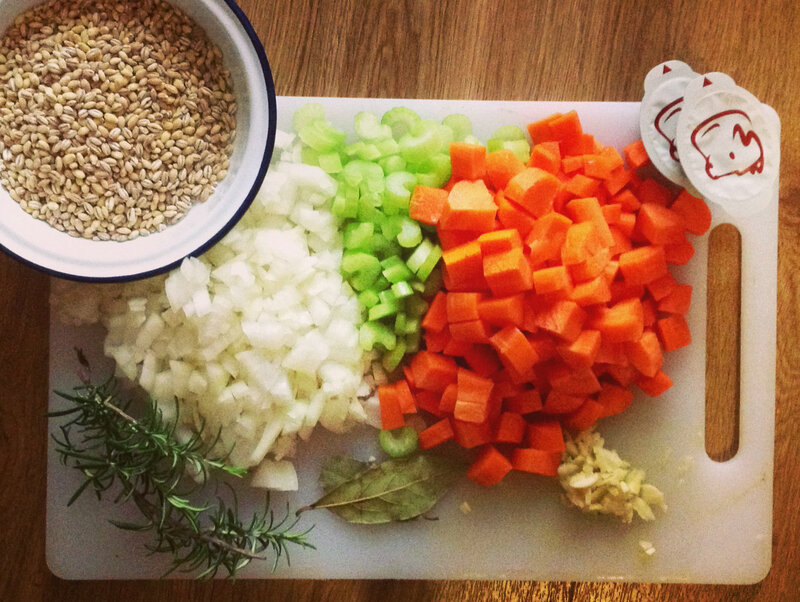 And so I made the recipe below, which uses big, juicy grains of pearl barley. At just 50p/500g it’s an absolute steal. The only thing you should be aware of is that pearl barley needs between 50-60 minutes to cook, so it can’t be rushed. But as with all slow-cooked food, the result is big flavour. If you’re the kind of person who really can’t manage a meal without meat, then pop some lardons in at the start. But this is so rich with flavour, I don’t think it needs it. Perfect peasant food just how it is. 1. Tip the pearl barley into a sieve. Rinse thoroughly, and leave to drain. 2. Heat the butter in a casserole dish, or heavy-bottomed saucepan. Cook the onions until they start to turn transparent. Add the celery and carrots, and cook for another five minutes – stirring occasionally. 3. Add the pearl barley to the pan, stir in the tomato concentrate, and then cover with stock. 4. Add the bay leaf and rosemary to the pan. Put the lid on, and leave to gently simmer for 50 minutes – 1 hour. * The stock I used recommended 1 pot per 500ml water. But there are two things worth bearing in mind. Firstly, that stock is salty. And secondly, that you’re basically making a vegetable stock anyway by simmering carrots, onions, celery and garlic. So I ignored the instructions, and used 2 pots for 1.5 litres of water instead.